Where and when was acupuncture discovered or developed? The public is uncomfortable with the idea of acupuncture. It seems foreign. We are familiar with drugs and surgery. Americans do not know the scientific basis and fear that it is some kind of Voodoo. I believe a search for the truth can give some very interesting answers. Question 1—Does it hurt? Sometimes there may be a little discomfort during insertion but most of my patients get very relaxed or fall asleep during their treatments. Question 2—How does acupuncture work? The traditional answer is: Energy pathways called meridians carry Qi (energy) throughout the body. Qi balanced and free-flowing through meridians provide the means for health maintenance and healing. Acupuncture removes blockages and re-balances the body’s energy through the meridians. The average American will want a little more reassurance and tie-in to the western mind. How does acupuncture work scientifically? The short and simple answer is that acupuncture works by stimulating the body’s natural healing systems. It has been used successfully for thousands of years. Scientific research has discovered the three mechanisms of acupuncture’s actions—neurological, biochemical and bioelectrical. I encourage you to download a copy of “Scientific Basis of Acupuncture” from the link at the end of this article.1 This will help us all become more familiar and comfortable with acupuncture. Question 3—Where and when was acupuncture discovered/developed? This article will introduce some exciting information. The average American may welcome the news that acupuncture’s existence could date back 4,000 years, to a monotheistic culture. “Bian Shi” or “sharpened stones” were used in the Neolithic or Stone Age (Wikipedia—Acupuncture History). In China during the Shang Dynasty (1600-1100 BCE) pictographs suggest moxibustion(burning the herb “mugwort”on acupoints) was used along with acupuncture. In 1991 when the 5,000-year-old mummified body of Otzi the Iceman was found frozen in the Italian Alps, there was even more evidence that pointed to acupuncture. Tattoos on Otzi’s body were crafted over many contemporary acupuncture points, suggesting he used it to treat some of his ailments. Acupuncture appears to have been used in regions other than China. However, its development and documentation are tied to China. 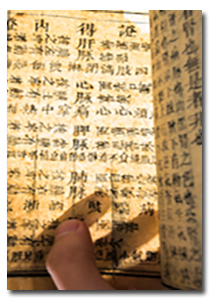 The Chinese people were excellent record keepers, with a written language that’s been used for more than 4,000 years. Even with this ability many records were lost. Around 200 BCE, Ch’in Shih Huang-Ti, declared himself the “First Universal Emperor of China”. He ordered the burning of books, records and ancient texts. The probable reason he did this was to eliminate historical records that would hinder the expansion of his political power and spiritual status. He ordered 400 Confucian scholars buried alive. And when he died, 10,000 of his mausoleum workers were forced to be entombed with him. The early history of this region would be totally lacking if it were not for the Confucius compilation of the writings of culture and history of the Chinese. This “Book of History” (Shu Ching) was hidden in the wall of Confucius’s house, and discovered when it was torn down in 140 BCE. 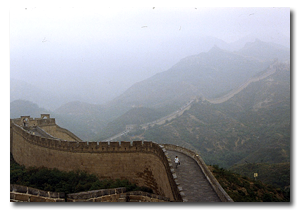 Inquisitive minds have investigated the ancient Chinese written language characters and have found that they correlate to the story in Genesis Chapters 1-11 in the Bible!2,3,4 Yes, before written language, civilization used the oral tradition and this tradition contained the events of creation, the flood and the dispersion from the Tower of Babel. We know this from analysis of these ancient Chinese characters! Another example is the character for boat. It includes the character for vessel…, eight… and mouth…. Does this make you think of anything? The Bible’s account of Noah and the great flood says that eight people (or mouths) boarded the vessel. The eight people were Noah, his wife, his three sons and their wives. Further analysis of many other ancient Chinese characters, illustrate the Genesis account. These little pieces of the puzzle point to a monotheistic early Chinese civilization, one that worshipped the one true God of the Bible. Before 550 BC, the Chinese worshipped Shangdi (pinyin: Shangdi, Wade-Giles Shang Ti). Literally, the term means “Above Emperor”, or put another way, “Lord on High”, “Supreme God”. No idol has been fashioned in his image because He has forbidden it. After extensive research, Christian missionaries and theologians have found Shangdi to be the God of Abraham, the “I Am”. The book titled “The Discovery of Genesis” further states that the sacrificial ceremonies, called “border sacrifices” performed by the emperors, were done “unto the earth” in the north of the country during the summer solstice and “unto heaven” in the south during the winter solstice. These rituals were similar to the Jewish sacrificial ceremonies. The Chinese sacrifices continued, with a recital similar to ones mentioned in the Book of Genesis, even after they lost their full meaning, until the last Chinese emperor in 1911 AD! With efforts to elevate the Emperor’s stature the worship of God by the people gradually ceased. Eventually only the Emperor was found worthy enough (by his counselors) to worship God. The Emperors continued the ceremonies from about 2600 BC to 1911 AD, over 4,500 years. Compare these excerpts. They sound remarkably similar. “Of old in the beginning, there was the great chaos, without form and dark. The five elements (planets) had not begun to revolve, nor the sun and moon to shine. In the midst thereof, there existed neither forms nor sound. Thou, O spiritual Sovereign camest forth in Thy presidency, and first didst divide the grosser parts from the purer. Thou madest heaven; Thou madest earth; Thou madest man. All things with their reproducing power got their power, got their being.” From Sacrificial Ceremony. Confucius says, “He who understand the ceremonies of the sacrifices to Heaven and Earth…would find the government of a kingdom as easy as to look into his palm!” This is quoted from the Doctrine of the Mean, xix. Bible-believing people sometimes associate acupuncture with sorcery, which is, according to the Bible deserving of judgment. The New Testament was written in Greek. Let’s look at the original Greek word that was used. Strong’s Exhaustive Concordance of the Bible, 1990- # 5331-“pharmakeia” which derives from root words describing medication, pharmacy, a druggist-derived mind-altering substance that can poison. Acupuncture is the scientifically based, stimulation of our God-given healing systems. It cannot be witchcraft or sorcery. The admonition against sorcery appears to be a grave warning against the inappropriate use of drugs. Did God get this one right? Our country’s current “Disease Care System” is strangling our economy. Costs have skyrocketed from $714 billion in 1990 to $2.5 trillion in 2009. The integration of Oriental Medicine (diet, nutrition, exercise, herbology and acupuncture) into a true “Health Care” system is the answer. These modalities are much safer, less expensive and very effective. By revealing the Godly roots and the scientific basis of acupuncture we can help people embrace this natural healing technique. The health benefits and economic savings, resulting from these natural therapies are essential for the future of our country. C.H. Kang, and Ethel R. Nelson, The Discovery of Genesis, How the Truths of Genesis Were Found Hidden in the Chinese Language (St. Louis: Concordia Publishing House) 1979. Chan Kei Thong with Charlene L. Fu, Finding God in Ancient China, How the Ancient Chinese Worshiped the God of the Bible (Grand Rapids: Zondervan), 2009. Ethel Nelson, The Original “Unknown God of China”-Answers in Genesis, June 1, 1998. Feel free to download a PDF of this article here.